I think my first impressions of Mr. Knightley are that he seems more of an older brother or even a father figure to Emma. I don't think there is a sense of superiority, maybe more of a familiarity with Emma. After all, he was 16 when she was born, almost a man. He has known her all of her life and therefore has the relationship with her to scold her, rebuke her, praise her and love her. Well I think a bit of both agreement and disagreement are in order. I really and truly think that Emma is trying to better Harriet. But it is a naïve desire on Emma's part because she does cause Harriet to think better of her social standing than what she actually is. So Emma is trying to better a friend, but really doing Harriet no favors by elevating her opinion of herself. I'm really not seeing anyone else stand out. I think Emma's father is a whiny bore. ha! I think the sister is as well! I am definitely not a fan of Mr. Elton and as of chapter 13 I really haven't met anyone else that stands out. Maybe later someone will come along. We'll see. I guess I would have to say Emma. I think she may be a "fixer" and I'm a fixer. I want to offer advise, fix the problem and move on to the next. I can't stand the paranoia of the father and sister and the being afraid to breathe lest they get sick with something attitude that they have. I love Emma's independence and her strength to carry on her household. I love her patience with her family. I think that she is young and thinks a lot of herself as only the young can do. Even though she has been the manager of her household for a long time there still is a lack of life experience that makes her naïve about people's temperments etc. 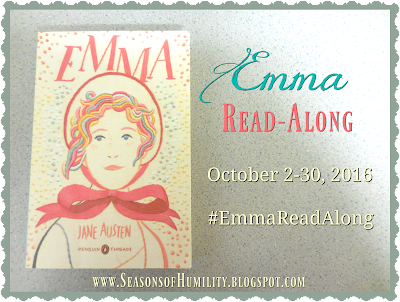 "The real evils, indeed, of Emma's situation were the power of having rather too much her own way, and a disposition to think a little too well of herself." "You will puff her up with such ideas of her own beauty, and of what she has a claim to, that, in a little while, nobody within her reach will be good enough for her. Vanity working on a weak head, produces every sort of mischief." "One half of the world cannot understand the pleasure of the other." Valetudinarian: A person who is unduly anxious about their health. Yeomanry: A group of men who held and cultivated small landed estates. Chusing: This is a alternate spelling for the word "choosing" but I stumbled for a moment when I came across it. It looks kind of neat though! Philippics: Bitter attack of denunciation, esp. a verbal one. This is my second time reading Emma. If you haven't read it there is still time to hop in on the read-along. Visit Amber's blog at Season's of Humility to get all of the details and the schedule. I'm currently really behind on this week's reading, so you're not alone! It's great to read your answers. :) I think that's a good point about Mr. Knightley being like an older brother in some ways, and being really familiar with her and her family - so he can say more to her and be more honest than others. And I love what you noted about Emma's independence and her patience with her family! Those are definitely admirable traits. :) When contrasted with her dad and sister, her independent spirit does shine! Those are all awesome quotes you chose! The last one is on the back of my copy of the book. :) It's a thought-provoking line...and the context is rather interesting. Always fun to do these read-alongs with you, Julie! I'm enjoying our vacation Amber, thanks! I plug along at the reading in the evenings before bed. Big weekend plans so will probably not be able to hop over to your blog on Sunday, but will get there the beginning of the week. Thanks so much for stopping by and especially thanks for hosting the read-along! Good post, Julie. I've fallen a little bit behind, but am getting caught back up again. It's pretty interesting to see how different the language was back then, isn't it? Even though sometimes it slows down the reading. Hope you have a great vacation! 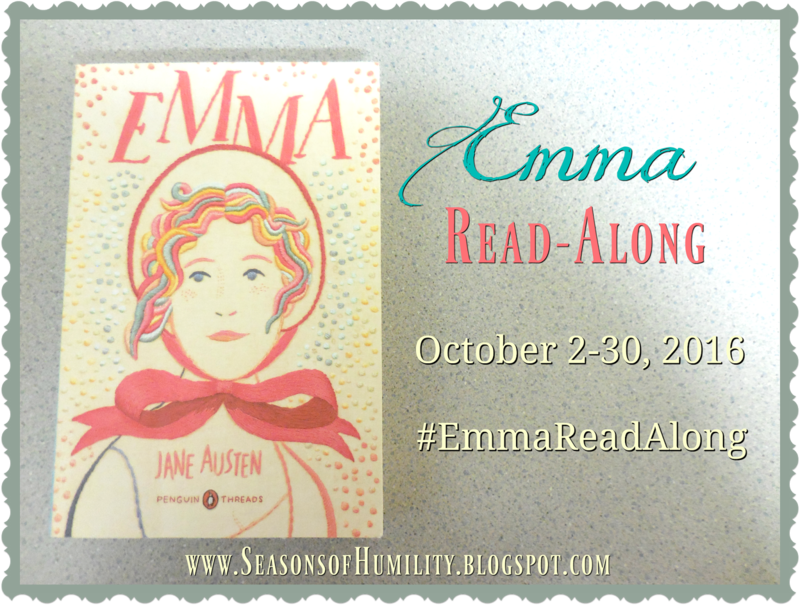 For some reason Emma has always been a hard book for me to read. I don't know if there is just too much dialogue I don't understand or what. I like the characters, it is just not my favorite Austen book. I do like coming across some new words to look up and learn. ha! Thanks for the vacation wishes. It is raining and I love the rain! Oh yes! The second quote you listed! I was thinking about that one! Those are very interresting words! I am the kind of person who forgets to look these things up to it is nice that you do, and that you shared them! And nice answers!